Vibratory blur with standard light. Note relatively wide "gray" zone of blur. Dramatic lateral excursions due not only to bowing, but also flaccidity. Eventual recoil towards midline, but cords never come into full contact before they are again thrown to their maximum lateral vibratory excursion, as in photo 3. Open phase of vibration showing large amplitude in middle voice. Maximum closed phase, but with persistent open area anteriorly (at arrow) If this area of exaggerated flaccidity oscillates independently, a rough quality is added to the voice. Between open and closed phase, showing vibratory contact is aberrant. Open phase vibration, strobe light. Notice the large amplitude of vibration. The wide lateral excursions suggest flaccidity, especially when this is seen in middle voice. Partially closed phase, strobe light. Notice that the anterior cords are more flaccid, with delayed return to midline contact. When this is seen, that anterior segment may vibrate independently and cause a rough, gravelly voice quality. 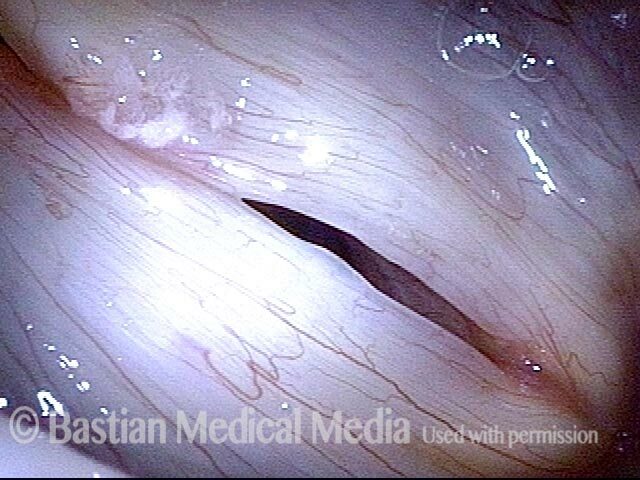 The capillary ectasia, left vocal cord is an incidental finding an not related to the patient’s rough voice quality. Coming to closed phase, but with persistent anterior open segment. Closed phase of vibration, strobe light. Now seen under the strobe light, the amplitude of vibration of the vocal cords is excessive. 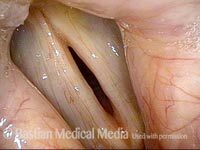 These flaccid vocal cords lack the firmness to "recoil" back to the mid-line, until maximal separation of the cords is reached. As the patient is reaching the closed phase of the vibratory cycle, the anterior cords are arriving late to closure, a typical finding with flaccid vocal cords. Now at the maximum closed phase of vibration, a pinhole of incomplete closure is seen. In this case, there is no independent oscillatory vibration of the anterior segment of the vocal cord. Under strobe light, the vocal cords begin opening at the area of flaccidity anteriorly. The patient has a husky and gravelly voice quality (view here rotated 90 degrees counterclockwise). Vibratory separation continues and is still greatest anteriorly. Open phase of vibration now complete. Distance of lateral excursions is large, indicating the flaccidity of cords. The cords are returning to closed vibratory position, but anterior cords close late due to flaccidity. Sometimes this anterior segment vibrates independently and this causes a rough voice quality. At maximum closed phase, there is still a tiny incomplete closure anteriorly.